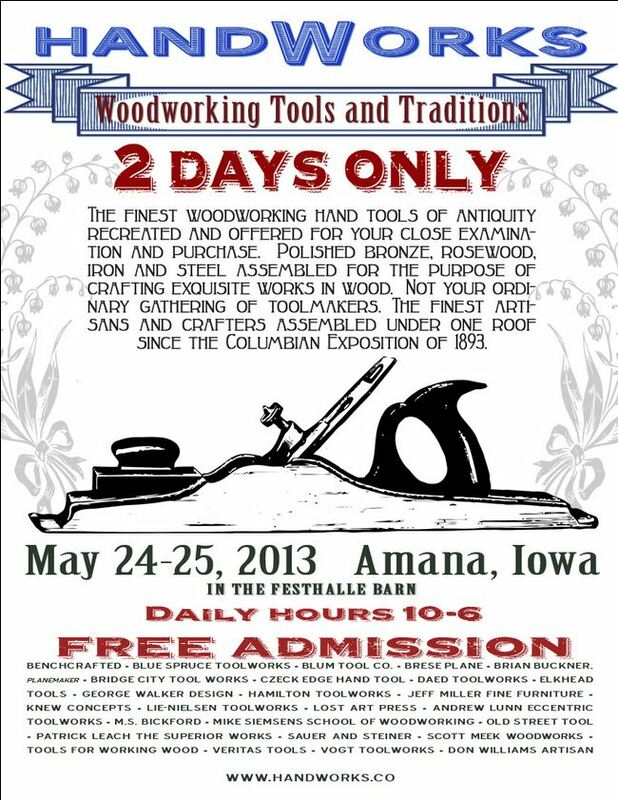 Just a reminder that this next weekend, May 24th and 25th, is the first ever (of many, hopefully) Handworks event in Amana, IA. At this point, if you’re just now deciding to go, you should seriously consider bringing a tent, because Amana is already a long-weekend destination and this is Memorial weekend. I’m sure most places are completely booked. If you are headed there, and you know you won’t be spending the entire 16 hours of the event in that huge barn, then you probably want to know what else there is to do in Amana, right? Well… I’ve no idea. Sorry. At the bottom of that blog post is a list of links you might also want to check out. I fully expect the antique stores to take a hit on their hand tools this weekend. What do you think?